Always impeccably styled in a button down, creased slacks and dress shoes, our talented feature this week after school pins patterns and sews stitches. As noted in a promotional descriptor, we can find his youthful fingers on a sewing machine for hours or at least until his mother tells him it’s time for bed. He is young, gifted and Black. 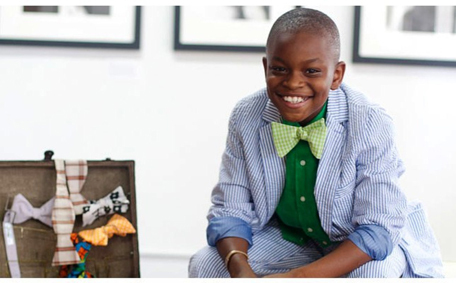 Moziah Bridges, then a fourth grader at Rozelle Elementary School located in Downtown Memphis, started his career as a fashion designer at the age of 9 in June of 2011 with his exclusive line of Mo’s Bows. Sayle further reveals that Moziah – “Mo” for short – delivered one of his ties to Fox 13’s bow-tie wearing weatherman Joey Sulipeck who wore the gift on the air. Next, comments Sayle, he plans on sending a few of his bow ties to his pop idols Justin Bieber and Chris Brown. He has been a guest on the Steve Harvey show and has been featured in British GQ, in Oprah’s O’Magazine, and in Forbes. Tramica Morris, Mo’s mom, positions that “Old School” trends as mirrored by his well-dressed dad and grandpa inspired his love for fashion and instilled in her son the importance of dressing for success. A huge selection of Mo’s bow ties are from his grandmother’s vintage fabric, respective selections of which date back more than 50 years. And it was, in fact, his grandmother who taught him to sew. Mo’s Bows is indeed strongly guided by his mother and grandmother according to Sayle. After stopping by his grandmother’s house to pick out fabric and patterns, he settles down with his mother and grandmother and starts stitching. Says Mo, “I just pick whatever I see. It has to speak to me. It has to be fun. It has to be preppy,” as quoted in Rae Lyn Hartley’s LocalMemphis.com’s August 19, 2013 posting. Strauss adds that Mo’s designs vary widely from traditional polka-dot and stripes to multi-colored paisley and sports team themed ties. He tots his bows in an old suitcase. Strauss cites that our youthful Memphis native has earned over $30,000 thus far as of 2013. He sells on his own website accessible Etsy page. Founded in 2005, Etsy is an online marketplace where people around the world connect to buy and sell unique goods. The Forbes account further notes that Mo’s Bows are also available in upscale boutiques in Tennessee, Alabama, Texas, Louisiana, South Carolina, and in Arkansas. Looking towards the future in McCullough, he views prospects to sell his bow ties in Macy’s or Dillard’s and to see them included in New York’s fashion magazines. He has also created a product line that raises funds for charity. His next step as a manufacturer per the Defender writing are pocket squares, cologne, and later on down the line, suspenders. He is even looking to make neck ties since they are a part of his sixth grade school uniform. “I’m very proud of him. It’s still sinking in,” said Morris who in published accounts left her career in retirement services to spend more time building her son’s business. She also works part time for her mom’s trucking company, in between sewing, organizing trunk shows and press trips. Balancing academics with fashion seems to be a “breeze” for Mo as cited in noted articles. But, he admits that he owes it all to mom. Hartley writes that Morris “makes sure her pint-size businessman stays grounded” and that homework and chores are priority as, she says for example, the lawn still needs to be mowed. 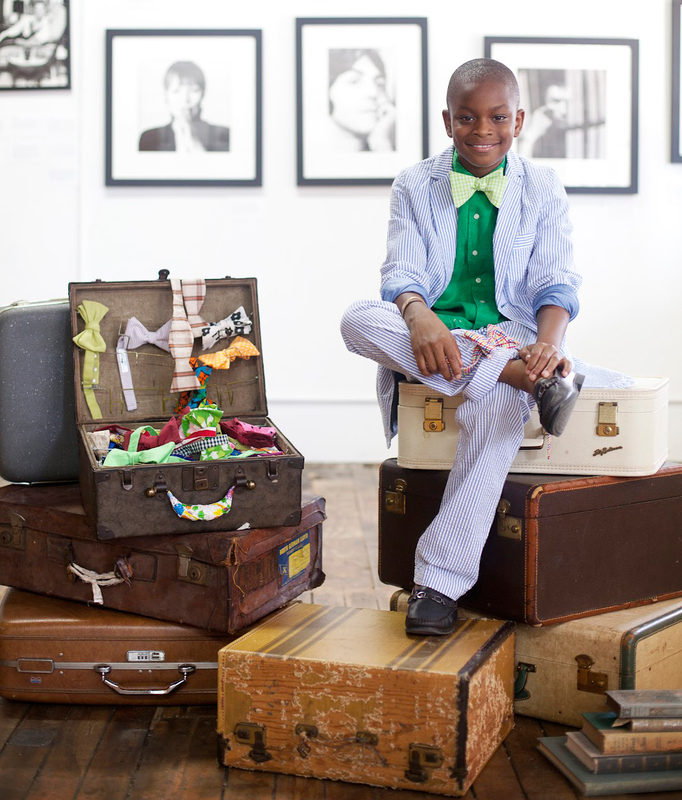 With a birthday in November, now that our dapper 12 year-old has a successful run in fashions; is a profitable business owner, and is looking to be bigger than Ralph Lauren, he has his sights on Parsons School of Design for college. But as Mo passionately pursues his goals in the world of fashion commerce, Rheana Murray in the New York Daily News reminds us that in this journey towards the realization of his dreams, he must first finish sixth grade.